Dr. Bjork received his Optometric Degree from the Indiana University School of Optometry in May of 2001. The training provided a very broad understanding of Optometry. 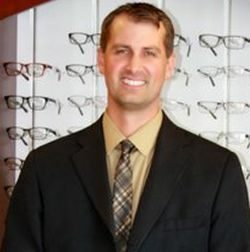 Dr. Bjork has practiced Optometry in New York, Illinois, and now in his home state of Wisconsin. He practices with the philosophy that the patient comes first and emphasizes the ability to improve the quality of patients daily lives through better vision. His primary focus is on family vision care, which includes eye health examinations, contact lenses, children’s vision and LASIK co-management. Dr. Bjork has the latest state-of-the-art technology which allows for early diagnosis and treatment of patients with cataracts, glaucoma, diabetic retinopathy, macular degeneration, along with other vision pathology. Outside of work Dr. Bjork enjoys spending quality time with his family. They enjoy volleyball, basketball, traveling, and taking in all of the fun community events.